Clockwise frae tap: Delta Force o Task Force 20 alangside truips o 3rd Battalion, 327t Infantry Regiment, at Uday Hussain an Qusay Hussein's hideoot. 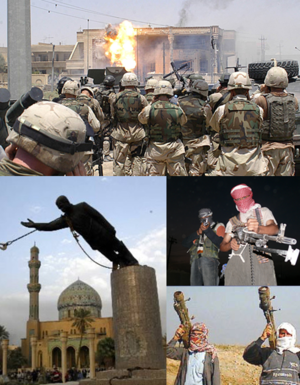 ; Insurgents in northren Iraq; an Iraqi insurgent firin a MANPADS; the topplin o the Saddam Hussein statue in Firdos Square. For fichtin atween insurgent groups, see Ceevil war in Iraq. * "injured, diseased, or ither medical": required medical air transport. UK nummer includes "aeromed evacuations"
** Tot daiths include aw addeetional daiths due tae increased lawlessness, degradit infrastructur, puirer healthcare, etc. The Iraq War[nb 1] wis an airmed conflict in Iraq that consisted o twa phases. The first wis an invasion o Iraq stairtin on 20 Mairch 2003 bi an invasion force led bi the Unitit States. It wis follaed bi a langer phase o fichtin, in which an insurgency emerged tae oppone the occupyin forces an the newly furmed Iraqi govrenment. The U.S. completit its widrawal o militar personnel in December 2011. Houiver, the Iraqi insurgency continues tae cause thoosands o fatalities. ↑ The conflict is an aa known as the War in Iraq, the Occupation o Iraq, an the Seicont Gulf War (Gulf War II). It wis referred tae as Operation Iraqi Freedom bi the Unitit States militar, frae 2003 tae 2010. ↑ "Last U.S. troops leave Iraq, ending war". USA Today. 17 December 2011. Retrieved 18 December 2011. ↑ "Sectarian divisions change Baghdad's image". MSNBC. 3 July 2006. Retrieved 18 February 2007. ↑ "U.S. says Iraq pullout won't cause dramatic violence". MSNBC. 18 November 2010. Retrieved 26 November 2010. ↑ "UK 'to continue deporting failed Iraqi asylum seekers'". BBC. 22 November 2010. Retrieved 26 November 2010. ↑ "Deputy Assistant Secretary for International Programs Charlene Lamb's Remarks on Private Contractors in Iraq". State.gov. 17 July 2009. Retrieved 23 October 2010. ↑ Rubin, Alissa J.; Nordland, Rod (29 March 2009). "Troops Arrest an Awakening Council Leader in Iraq, Setting Off Fighting". The New York Times. Retrieved 30 March 2010. ↑ "The Kurdish peshmerga forces will not be integrated into the Iraqi army: Mahmoud Sangawi — Interview". Ekurd.net. 22 January 2010. Retrieved 23 October 2010. ↑ Pincus, Walter. "Violence in Iraq Called Increasingly Complex". Washington Post, 17 November 2006. ↑ "Iraq War" (PDF). Retrieved 2012-11-18. ↑ "Operation Iraqi Freedom". iCasualties. Retrieved 24 August 2010. ↑ "Home and Away: Iraq and Afghanistan War Casualties". CNN. Retrieved 30 March 2010. ↑ "Ministry of Defence | Fact Sheets | Operations Factsheets | Operations in Iraq: British Fatalities". Mod.uk. Retrieved 17 October 2009. ↑ "Forces: U.S. & Coalition/POW/MIA". CNN. Retrieved 22 February 2011. ; As of July 2012, seven American private contractors remain unaccounted for. Their names are: Jeffrey Ake, Aban Elias, Abbas Kareem Naama, Neenus Khoshaba, Bob Hamze, Dean Sadek and Hussain al-Zurufi. Healy, Jack, "With Withdrawal Looming, Trails Grow Cold For Americans Missing In Iraq", New York Times, 22 May 2011, p. 6. ↑ "Casualty" (PDF). Retrieved 2012-11-18. ↑ 23.0 23.1 iCasualties.org (was lunaville.org). Benicia, California. Patricia Kneisler, et al., "Iraq Coalition Casualties"
↑ 24.0 24.1 "Defence Internet Fact Sheets Operations in Iraq: British Casualties". UK Meenistry o Defense. Latest combined casualty and fatality tables. ↑ 26.0 26.1 "U.S. Department of Labor — Office of Workers' Compensation Programs (OWCP) - Defense Base Act Case Summary by Nation". Dol.gov. Retrieved 15 December 2011. ↑ 27.0 27.1 T. Christian Miller (23 September 2009). "U.S. Government Private Contract Worker Deaths and Injuries". Projects.propublica.org. Retrieved 23 October 2010. ↑ Moore, Solomon; OPPEL Jr, RICHARD A. (24 January 2008). "Attacks Imperil U.S.-Backed Militias in Iraq". The New York Times. ↑ Greg Bruno. "Finding a Place for the 'Sons of Iraq' - Council on Foreign Relations". Cfr.org. Retrieved 26 December 2011. ↑ Press release (28 October 2003). "New Study Finds: 11,000 to 15,000 Killed in Iraq War; 30 Percent are Non-Combatants; Death Toll Hurts Postwar Stability Efforts, Damages US Image Abroad". Project on Defense Alternatives (via Common Dreams NewsCenter). Retrieved 2 September 2010. ↑ Conetta, Carl (23 October 2003). "The Wages of War: Iraqi Combatant and Noncombatant Fatalities in the 2003 Conflict — Project on Defense Alternative Research Monograph #8". Project on Defense Alternatives (via Commonwealth Institute). Retrieved 2 September 2010. ↑ "Amnesty: Iraq holds up to 30,000 detainees without trial". CNN. 13 September 2010. Retrieved 6 January 2011. ↑ "Iraq Body Count". Iraq Body Count. Retrieved 14 December 2011. ↑ "Iraq War Logs: What the numbers reveal". Iraq Body Count. Retrieved 3 December 2010. ↑ 41.0 41.1 "Iraq War". Britannica. Encyclopædia Britannica. Retrieved 27 October 2012. ↑ Iraq war illegal, says Annan BBC 16 September 2004. ↑ "The US invasion has caused nearly three-quarter million Iraqi deaths". Wsws.org. Retrieved 22 September 2012. ↑ "A chronology of the six-week invasion of Iraq". PBS. 26 February 2004. Retrieved 19 March 2008. ↑ Cutler, David (18 December 2011). "Timeline: Invasion, surge, withdrawal; U.S. forces in Iraq". Reuters. Retrieved 18 December 2011. ↑ "Last US troops withdraw from Iraq". BBC. 18 December 2011. Retrieved 11 May 2008. This page wis last eeditit on 14 Februar 2018, at 23:04.